Despite the fact that AV Nackawic was the first prehydrolysis Kraft mill conversion in Canada, it still struggled with a lack of resources due to the current economic downturn. The rapidly rising cost of power has increased the importance of energy efficiency in pulp mills, and for this reason, AV Nackawic reached out to the expertise of graduate student Rohan Bandekar from the department of chemical engineering at the University of New Brunswick in Fredericton. Rohan saw AV Nackawic’s energy-efficiency problem as the perfect opportunity to test the practical understanding of industrial processes he learned during his academic studies. Rising to the challenge of troubleshooting a process problem in the heat-recovery system for AV Nackawic, Rohan drew upon everything he had learned throughout his academic career and put it to practical use - turning his abstract knowledge into concrete results. 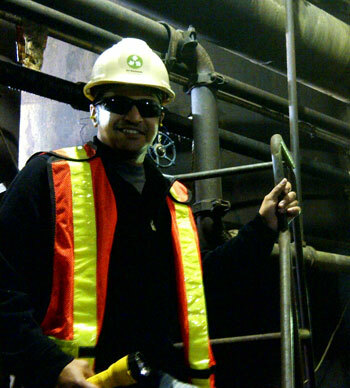 In only eight short months, Rohan, with the guidance of his supervisor Carolyn Drost, senior process engineer at AV Nackawic, successfully addressed ongoing process issues that were preventing the energy-recycling system at the mill from reaching its full potential. Rohan's success has led to savings of approximately $40,000 annually. AV Nackawic was so impressed with his motivation and expertise that they offered Rohan a position on their team as a junior process engineer, a position he still holds. "Rohan brought drive and enthusiasm to everything he did. His success in this project has been a benefit felt by all," said Carolyn. Rohan was connected with AV Nackawic through the Mitacs-Accelerate Internship Program - a program in which companies are matched up with graduate students and postdoctoral fellows who apply their skills to solve business research challenges. Throughout his internship, Rohan was also able to benefit greatly from his hands-on industry experience as he improved his public speaking abilities and learned more about Canadian work culture. "Mitacs Accelerate internships provide a unique opportunity for students to step out of the academic world and get a taste of the real-life industry," he said.